If you live in the Finger Lakes region of New York State then you already know how lucky we are. But if you want to visit the Finger Lakes and are wondering how quickly you can jump into the Finger Lakes, once you arrive to this area, it will likely take you less than a ten minute drive. 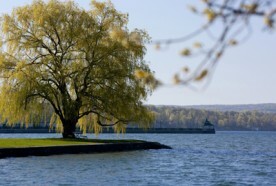 Owasco, Cayuga, Skaneateles; there are so many to chose from here in Cayuga County! Why not jump into all of them? We probably take for grant ed our proximity to each of the Finger Lakes. Hopefully we recognize and are grateful for these beautiful waters that surround us. Yesterday after kayaking for awhile on Owasco Lake, (which is the smallest of the six large Finger Lakes,) we beached our kayaks and cooled off in the crystal water. We enjoyed the wild morning glories along the shore, and the ducks that swam nearby. From reports of fishermen catching large, healthy, trout and bass, it attests to the health of Owasco Lake. Plus it’s noticeable how much pride people take in their camps and cottages. Seldom do you see any litter floating in the lake or along the shoreline. Emerson Park is the gateway to Owasco Lake. Bring a picnic, park your car, and let the kids play and swim all day long. Visit the Ward O&apos;Hara Agricultural Museum, play some disc golf, or take in a play at the Merry-Go-Round Playhouse. All three venues are located on the park property! Emerson Park is also the home of some great Cayuga County events! The Great Race, TomatoFest, and The Annual Father&apos;s Day Car Show, are just a handful of events that are sure to please anyone. Due to the popularity of The G reat Race, there are more and more people out canoeing getting ready to strut their strokes. Don&apos;t have a canoe to call your own? 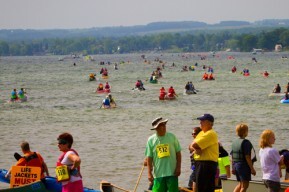 Be sure to visit Owasco Paddles at Emerson Park and rent one. Want to bring your canine friend with you too? Not a problem Owasco Paddles has life jackets for your furry family members as well! We are so blessed in the Finger Lakes Region to have such beautiful lakes close by. With the recent heat-wave, there’s nothing better than immersing yourself into the cool clean water, looking around at the magnificent sky, and feeling thankful. Which is your favorite Finger Lake?